Download the Daily Workflow Planner! Awesome! Click here to download your copy of The Daily Workflow Planner ! Back when I worked at a corporate job, things were simple. I knew what needed to be done daily, weekly, monthly and quarterly, and I knew what the priorities were, because I had a fabulous boss and great communication. Then I became an entrepreneur, and it was my job to decide what the priorities were. Suddenly, I had to figure out exactly how to spend my day – and choosing the wrong things could be disastrous for my small business. I pinned dozens of blog posts, bought expensive planners and read some truly excellent books. But while it all sounded great, and I strove towards simplifying, eliminating and focusing on that one, essential thing, it just wasn’t that realistic for a designer with many active clients. I needed a better way to manage everything I was doing, balance my client projects with building a business, and use my time effectively. It’s only since I’ve created and started using my Daily Workflow Planner that I finally feel like I have a handle on my day. I have a hard time bouncing back and forth between CEO-mode and employee-mode, so I created a tool to help battle the overwhelm. The key here is to spend 10 minutes each morning as the CEO, deciding your priorities in advance before jumping in to your efficient employee mindset. Start the worksheet with you daily “musts”. These are the things you need to do every single day. I like starting with the easy stuff, because it helps me get warmed up and in a rhythm. For me, the first things I do every day are (1) update my business budget in Everydollar, (2) work through my email inbox, flagging everything that needs my attention since the last time I checked and (3) review my project master lists in Asana. #protip: I’ve left these blank on the download so that you can select your own. You can use almost any program (MS Paint, anyone?) on your computer to add your own in before printing, since they’ll be the same errrrrrday. The next section is your Daily Brain Dump. This is a space where you can scribble all the things – things you may or may not have time to do today, but you know you need to get done at some point. Get it all out! I also utilize this section heavily when I’m working through my email inbox! Next up is your five minutes or less section. This is the area where strict essentialism fails for me. Yes, I know I need to get to the most important things quickly, but sometimes a quick email response or file tweak can help someone else get moving faster and clear my head. So, I let myself choose up to five items that will each take fewer than five minutes to kick off the day. 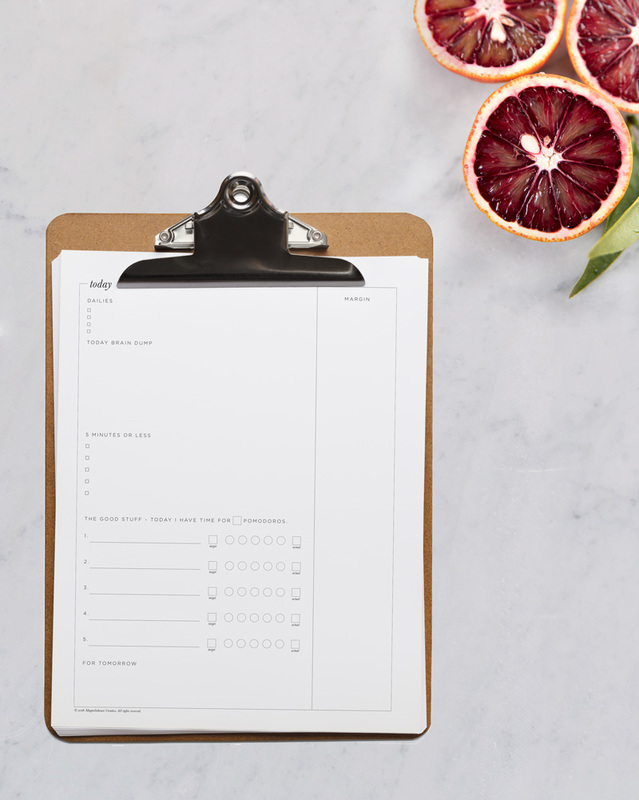 Because it’s so easy to get bogged down in the minutiae, be sure to finish your planning before crossing these items off your list, and set a timer to keep it to a strict maximum of 25 minutes. From here, we move into the good stuff – the projects you plan to spend the core of your day working on. Once we’ve gotten to this point, I find that the Pomodoro Technique works best for me to combat procrastination and overwhelm. To know how much you can squeeze into the day, you’ll need an honest estimate of your available work time. Count the hours you have before the end of the day, remembering to subtract for a lunch break and any meetings on your calendar, and divide that number by two. Since each pomodoro sprint is 25 minutes, with a five minute break in between, you’ll have the maximum number of cycles you can schedule for your day. With that number in mind, choose the major projects you need to get done today, and assign them each a target number of pomodoros. At this point, it really is important to prioritize from most important to least, since you’ll be working on each task until completion. No bouncing around or skipping ahead! Use the ‘For Tomorrow’ section to note anything that doesn’t fit into today’s schedule. Finally, it’s go time. Use the timer of your choice to track each cycle. If you’re new to Pomodoro, that’s 25 minutes of focus followed by a five minute break. Repeat that 4-5 times, and you’ve earned yourself a longer break of 15-30 minutes. As you finish a cycle, color in the circle on your planner to track your progress (because it’s fun, duh), and note the actual number of blocks it takes you to complete the project. I like to use PomoDone, since it syncs with my Asana task list, but Pomodoro One is also fabulous if you’re looking for something a little simpler. You’re free to do whatever you wish during your breaks, but I’ll dare to suggest that there might be a better way to utilize this time than scrolling through Instagram. I try to get up out of my chair, stretch something, and focus my eyes away from a screen during my short breaks to keep myself sane. If I’m in an awesome flow, I might let myself skip every other short break. Longer breaks are a great time for a cup of coffee, a quick email check or a snack. You’ll notice on the right side of the worksheet we’ve left a space for “margin”. Use this space to make quick notes of anything that pops up (ideas, to dos, distractions) during your focused sprints. Get it out of your head, onto paper, and return quickly to your focused work. Your most fabulous ideas will be there waiting for you at the end of the day. Finally, as you finish up your last cycle of the day, make note of your current progress. How did you do at realistically estimating your time? Anything that remains on your list can be added to the ‘For Tomorrow’ section, which might make a reappearance during your brain dump the next morning. At this point in the day, I’ll do one more email check – looking only for the super-urgent, update my master lists in Asana and do a quick social media review. Then you’re done for the day, and completely free to leave work at work until the next morning. ← Turn problem clients into dream clients by rocking your welcome guide with these essentials.